Ultrasound has long been a staple of hospitals around the country for quick and effective imaging. Yet only in recent years has the emergence of lightweight and portable mobile ultrasound changed the market. Companies producing these new-age ultrasound devices aggressively compete in how they market their devices. But how do they really stack up against each other, and against the more traditional ultrasound machine? This post will consider two portable ultrasound devices, the Phillips Lumify and the MobiSante MobiUS SP1. Ultrasound is a great product, and portable ultrasound is even better. Or is it? Hospitals may be concerned with the ability of a smaller device to produce clear images in a sector dominated by larger and more powerful devices. Yet a 2012 study demonstrated that handheld ultrasound devices produce images just as good as larger devices (Kimura, B, Gilcrease, G, Showalter, B, Phan, J, and Wolfson, 2012). Even more, technology has improved since the 2012 study, and device maker Philips launched their device just last year (Philips, 2015). Traditional ultrasound machines cost $300,000 or more, while the MobiUS costs only $7,500 (Stylist). Nonetheless, one company has taken the price competition even further. Phillips has chosen to offer their Lumify ultrasound probe for only $199 a month, averaging $2,400 a year not considering the recommended $75 a month warranty coverage (Philips, 2015). Such lease deals have put advanced technology and newer equipment within reach of those who might not have been able to afford the upright costs. Promoting the devices can be an art in itself. Philips not only released a press release but went as far as producing a unique website for the product that even advertises its pricing plans (Philips, 2015). MobiSante, on the other hand, does not publish the price of their devices (MobiSante). Where is this ultrasound to be used? Companies marketing portable ultrasound should capitalize off of the portability of the products. Portable ultrasound fails to inspire a purchase decision if portrayed as a replacement for traditional US machines. Why would a hospital pay for lightweight ultrasound if they already have larger machines that would be used in the same place and time? 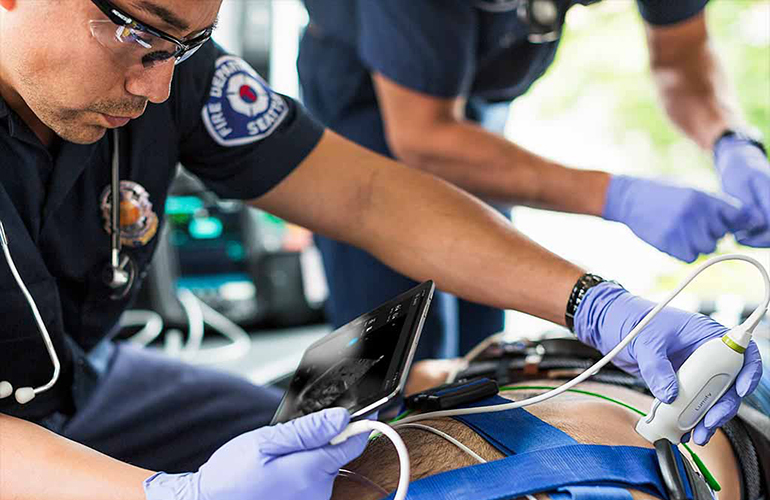 Instead, maybe companies should direct their marketing towards EMS agencies, as evidence exists that ultrasound can even be used on ambulances (Boniface, Shokoohi, Smith & Scantlebury, 2011). Kimura, B, Gilcrease, G, Showalter, B, Phan, J, and Wolfson, T. (2012, January). Diagnostic performance of a pocket-sized ultrasound device for quick-look cardiac imaging, The American Journal of Emergency Medicine, Volume 30, Issue 1. Retrieved from: http://dx.doi.org/10.1016/j.ajem.2010.07.024.